The word pyramid breaks into “Pyr” meaning “Fire” and “Mid” meaning “Middle” – The Fire in the Middle or the Fire Within. One symbolic interpretation of the pyramid is the human sitting in a cross-legged meditative position. The meditator’s knees/buttocks are the four bottom points and the head is the top point. The eye in the capstone is the meditator’s third eye chakra, or the pineal gland located at the geometric center of the brain. The early Christians and pre-Christians were Gnostics who focused on attaining spiritual knowledge by introspection and study of the divine spark within. Rene Descartes, the father of modern philosophical skepticism, and many other great minds believed firmly in an immortal immaterial soul. Descartes said the “seat of the soul,” or the place where the soul interacts with the physical body is the pineal gland. The pineal gland produces Pinoline, Melatonin, and a strong hallucinogen called DMT released each night during dream states, before birth and at death. The word “secret” comes from “secretion.” Could this natural secretion be the ultimate secret? The Numerology and Magic Mushroom chapters will delve deeper into this. 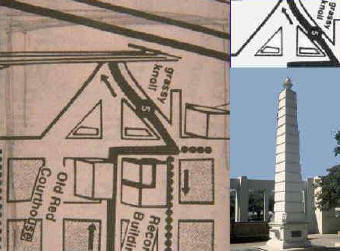 London’s Big “Ben,” like the Egyptian “BenBen” stone, is shaped like an obelisk/pyramidion. Nearby sits the “London Eye” Ferriswheel giving us symbolically a huge all seeing Eye and the Big Ben pyramidion. The Eye is supported by a base shaped like a Masonic compass measuring 33 degrees, and contains 32 “eye pods” (IPods?) which people ride in. The all seeing Masonic London Eye also just happens to be staring at the Houses of Parliament. Time Warner, CBS, Dairy Queen and many other corporate logos use the all-seeing eye. Many more companies/organizations use the pyramid(s) such as Sprint, Conseco, Creative Technology, Citgo, Carsey Werner, MI5, Pyramid Life Insurance, Pyramid Sun Fest, Camel Cigarettes, Delta, Naval Air Warfare Center, AccessHollywood.com, Columbia Records/Pictures, Paramount Pictures, Bass & Co. Beer, and the American Business Awards. 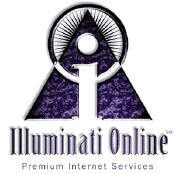 Fidelity Investments, America Online, Illuminati Online, Nickelodeon, Kindercare, Total Information Awareness, and the Dollar Bill seals all contain both the eye and pyramid together. Keystone Beer refers to the Capstone also called the Keystone of the Pyramid. Bass & Co. Beer also uses the pyramid. Coors and other beers use mountains. Evian water depicts 3 mountains like the 3 pyramids at Giza, and Evian is an anagram for Naïve which says innocence, purity, pure water to the subconscious. Since mountains and pyramids are associated with spiritual ascent, the images and names unconsciously draw us to the products. The same goes for any logo that includes mountains, pyramids, waterfalls, sunshine, etc. these are powerful subconscious spiritual triggers being used to make their marks on us. “Not only is the sun important but the word ‘light’ is important in any context. Light is important philosophically, light is also important subliminally. If it is lite beer then shouldn’t it be lite? But look at the choice of the very spelling. If you’re drinking that, the implication is subliminally that you are drinking light, that’s why it becomes addictive, because your unconscious mind would love to drink light. That’s what we’re all about remember? Spiritual uplift. Well they’re going to hand it to you in this.